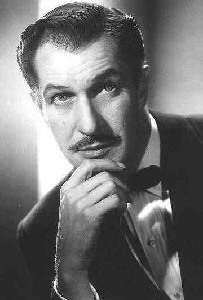 Question: Why Vincent Price? - he didn't play vampires. Answer: Because he was a renaissance "thriller", star of stage, screen, radio and tv. Because he created recordings and was a good lecturer. Because he was also an author, gourmet and noted art critic! One definition for "daemon" is a person who is part mortal and part god. Can there be any doubt the definition fits Mr. Price? "Urbane" refers to someone who is refined and knowledgeable, with experience gained from traveling the world, and sophistication gleaned from wide-ranging social circles. Vincent Leonard Price, Jr. was born in St. Louis, Missouri, USA, being the 3rd of four children from a family claiming their ancestry traced back to the Mayflower pilgrims. Over the years the family evolved into one of wealth and social prominance. Vincent's grandfather made a fortune from the Price Baking Powder Company. His father owned the National Candy Company, specializing in the manufacture of jellybeans and jawbreakers. The family fortunes enabled Vincent to grow up in the midst of cultural riches as well as the monetary sort. At age 16, he was allowed to travel solo in Europe, where he visited the great art galleries of the Old World, inspiring his intention to become an art historian. His formal education was accomplished at Yale (degrees in Art History and English), the University of London (Masters in Fine Arts) and Nuremberg University. "Someone called actors 'sculptors in snow.' Very apt. In the end, it's all nothing." 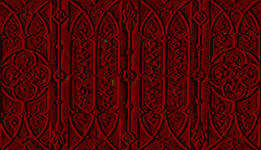 "'Gothic' is just a word recalling a multitude of sins!" "Tim Burton's film Vincent (1982) was immortality -- better than a star on Hollywood Boulevard." His third wife, Coral Browne, died of breast cancer two days after Vincent Price's 80th birthday in 1991. A memorial service was held at London's Farmers Church in the autumn, but Vincent's own frail health made it impossible for him to attend. When I was courting Coral, the first gift she gave me was a photo of herself simply signed, "Remember Coral" -- not really a challenge as the problem was, how could you forget her? I've come to believe remembering someone is not the highest compliment -- it is missing them. I find I miss every hour of Coral's life -- I miss her morning cloudiness, noon mellowness, evening brightness. I miss her in every corner of our house, every crevice of my life. In missing her, I feel I'm missing much of life itself. Over her long illness, as I held her hand or stroked her brow, or just lay still beside her, it was not the affectionate contact we'd known as we wandered down the glamorous paths we'd been privileged to share in our few years together; we were marching towards the end of our time and we both knew it. But, in our looks, our smiles, the private, few, soft-spoken word, there was hope of other places, other ways, perhaps, to meet again. One fact of Coral I'll always miss, her many, many devoted friends -- many here, today, in this beautiful church, celebrating her life more than mourning her death, and missing the liveliness of her wit, her personal beauty, her outgoing self. I love them all for loving her. Many of you have shared more of her life than I have, but that very private and intense passion for her is mine alone. She survived that last long year on the love of her friends, their caring and concern -- and very especially yours, dear John. I miss you all, and though we may not meet as often, nor in the great good company of my wife, you are in my memory locked. 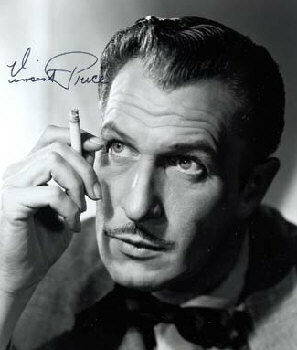 Vincent Price and Christopher Lee were born on the same day (27th May) and Peter Cushing was born on the 26th. Was the voice of the Phantom of Phantom Manor at Disneyland Paris. But his English narration was replaced by a French-speaking phantom. As Vincent related, when he and Peter Lorre went to view Bela Lugosi's body, Lorre, seeing Lugosi dressed in his famous Dracula cape, quipped, "Do you think we should drive a stake through his heart just in case?" He first appeared as an actor at the Gate Theatre, at the time a private experimental theater, as the judge and a policeman in the play "Chicago". He also appeared here as Albert in "Victoria Regina." The show's producer Gilbert Miller, took the play to Broadway, where it opened with Helen Hayes (America's number one actress at the time), in the lead. The play opened on December 26, 1935 and ran for three years. 1938 screen debut -- his first movie was "Service De Luxe." Many of his early films were costume dramas, such as "The Private Lives of Elizabeth and Essex" (1939), "The House of the Seven Gables" (1940), "The Song of Bernadette" (1943). Vincent is best remembered for his horror movies, however. Some notable examples are "The House of Wax" (1953), "The Fly" (1958) and "House on Haunted Hill" (1958). 1960 ushered in "House of Usher", which began Vincent's profitable association with American-International Pictures, Roger Corman and Edgar Allan Poe in the early 60's. The obvious benefit was portraying a wide variety of characters. The possible downside: he was typecast for the remainder of his career. One such film resulting from being typecast was "The Abominable Dr. Phibes" (1971). There was one noteworthy escape from being typecast when Vincent returned to the stage in later years, touring with his one man show of Oscar Wilde (to great acclaim) throughout America for many years. Inevitably, good parts became sparse, so Vincent abandoned films in the mid 1970's and appeared often on television. He even spoofed his own image in commercials and explored other possibilities. He played "the spirit of the nightmare" in a 1975 television special, "Alice Cooper: The Nightmare", not to mention his narration for Michael Jackson's "Thriller" video in 1982. "I have great admiration for rock `n roll, but not when it's done badly. My God! You know, I have a theory about how I get selected for these things. I think they've based a lot of their stuff on my movies. They go out and do the rock `n roll, and they're all high, and making the noise and flying around, and then they go back to their hotel room, turn on the TV, and there I am! Alice and I met a couple of times, and I liked him, then he asked me to do 'Welcome to My Nightmare'. "Then one time I got a call and they said would you come and do a recording with Michael Jackson, called 'Thriller'. I said, 'sure, I'll do anything.' So I went and did it, and I didn't think anything would happen with it, then it came out and sold 40 million copies! I didn't do it for the money, because I didn't have a percentage of it. It was just fun to do. You know to be identified with the most popular record ever made is not just chopped liver! It has really done me a lot of good, because it has given me a new audience." He also inspired young filmmaker Tim Burton to create the stopmotion animation short (with partner Rich Heinricks) called Vincent (1982), about a boy obsessed with Vincent Price. Vincent was pleased with the result and agreed to narrate the film. Starting in the 1980s, he hosted the PBS series "Mystery" for several years. 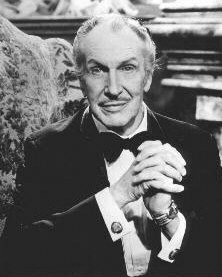 Vincent Price's last roles were as an elegant Russian count in "The Whales of August" (1987), as the inventor who brings the title character to life in Tim Burton's "Edward Scissorhands" (1990), starring Johnny Depp, and his final appearance was in the cable-TV movie "The Heart of Justice" (1993). In 1951, the actor and his second wife, Mary Grant Price, founded the Vincent Price Gallery and Art Foundation on the campus of the East Los Angeles Community College. He donated some ninety pieces to establish the first "teaching art collection" owned by a community college in America, and continued to contribute, with the help of other patrons. In 1991, he said: "We just wanted it to serve the community. We didn't want to make publicity out of it, since everything actors do is suspect! We just shut up and let it grow." Vincent's love of Native American art exposed another side of him: he worked for 15 years with the Department of the Interior and was quoted in an interview: "I have an enormous respect for the American Indian. I think we shut them off, at a period when they might have become the most creative people on the face of the earth. But we killed them off." In the mid 1970s, avid gourmet chef Vincent presented a cooking program for television. His career as a tv chef occupied him throughout several series. He also found time to write books, including cookbooks, such as "A Treasury of Great Recipes" (1965) and "The Come into the Kitchen Cook Book" (1969), both done with his second wife, Mary Grant. Vincent was also a fine arts lecturer of some note and has published books on art like "Drawings of Delacroix" (1962).